That's James gone for today. I'll be with you for a short while yet. Just to let you know, we're changing the format of our rolling news service from tomorrow. This style will be replaced with clickable articles, that we can easily amend so that you don't have to look for updates. Heavy traffic is being reported on the A6 at Penrith at the Market Square junction. 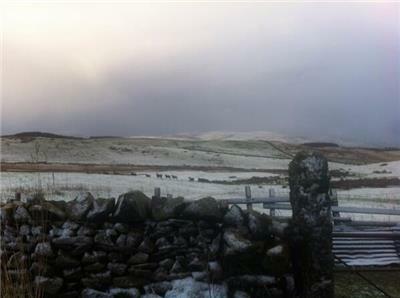 The Met Office have issued a yellow weather warning of ice for north and east Cumbria. Residents are being warned that there is a risk of ice on roads and pavements from tonight into tomorrow morning. The warning runs from 5pm tonight until 11am tomorrow. Newcastle United legend Alan Shearer has shown his support for Egremont charity Charlie and Kathleen Dunnery Children's Fund. Former striker Shearer handed out an iPad, DVDs and games at the Royal Victoria Infirmary in Newcastle. The charity makes donations to children's causes throughout the year. No snow in Carlisle... bit disappointed actually. 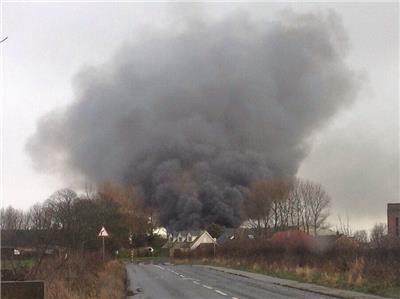 A reader has sent us this dramatic photograph showing the extent of the ongoing fire in Silloth. Fire crews are on the scene. Police are trying to trace a black Ford Focus after a three-car collision at Aspatria Business Park. The incident happened about 40 minutes ago and also involved a silver Vauxhall Astra and a white Ford Kuga driven by a 29-year-old man and a 51-year-old man respectively. There were no injuries but police say the Ford Focus failed to stop after the crash. Anyone with information on the incident can contact Cumbria Police on 101. The fire is at Hagan's Leisure holiday park at Silloth, but a spokeswoman declined to comment on the incident. A Cumbria Fire & Rescue spokeswoman has confirmed that there is a caravan on fire near Silloth airfield. An engine apiece from Silloth, Aspatria and Wigton are tackling the blaze, which began at about 12.20pm. It is not believed anybody is trapped and firefighters are using hose reel jets to put out the fire. We're getting unconfirmed reports of a sizeable fire on Silloth airfield. We're checking now. Police are appealing for witnesses after a two-vehicle crash on Monday. At about 5.30pm a small silver car and a blue van collided on Burgh Road between Monkill and Burgh by Sands. Anyone with information is asked to contact Cumbria Police on 101. The Challenge Cup and Super League trophies will be on display at Workington's X Catalogue store on Saturday at 11am. Have you completed the Cumberland News 'Our Cumbria' survey yet? We want to hear what your hopes and fears are for the year ahead. The findings will be published in the Cumberland News on Friday, January 31. To make your voice heard click here.